Gordon Brown drafts more non-Labour figures into his team, including former Met chief Lord Stevens. Who are Brown and Sarkozy both trying to woo? Miliband: A new world view? 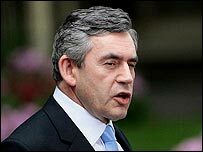 Gordon Brown should put the best interests of all the people in the UK first, and not the Labour Party or the rest of the world. An uphill task for Blair?